Recombinant monoclonal antibody to CD8 alpha/Lyt-2. Manufactured using AbAb’s Recombinant Platform with variable regions (i.e. specificity) from the hybridoma YTS 169.4. Specificity: Recognises the murine CD8 cell surface antigen expressed by a subset of T lymphocytes. The antibody has been shown to show depleting activity in vivo. Note on publication: Describes the production of the antibody and its effectivesness in CD8 subset depletion in vivo using flow cytometry studies. Flow-cytometry on mouse thymocytes using Ab00166. 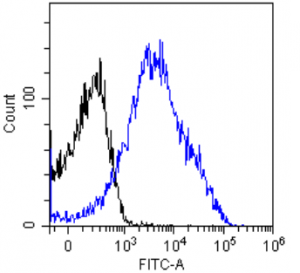 Flow-cytometry using the anti-CD8 alpha/Lyt-2 antibody YTS 169.4 (Ab00166) Mouse thymocytes were stained with unimmunized rabbit IgG antibody (black line) or the rabbit-chimeric version of YTS 169.4 (Ab00166-23.0, blue line) at a concentration of 10 µg/ml for 30 mins at RT. After washing, bound antibody was detected using anti-rabbit IgG JK (FITC-conjugate) antibody (129936) at 2 µg/ml and cells analyzed on a FACSCanto flow-cytometer. 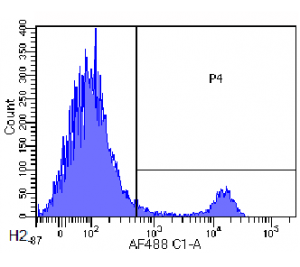 Flow-cytometry on mouse lymphocytes using Ab00166. 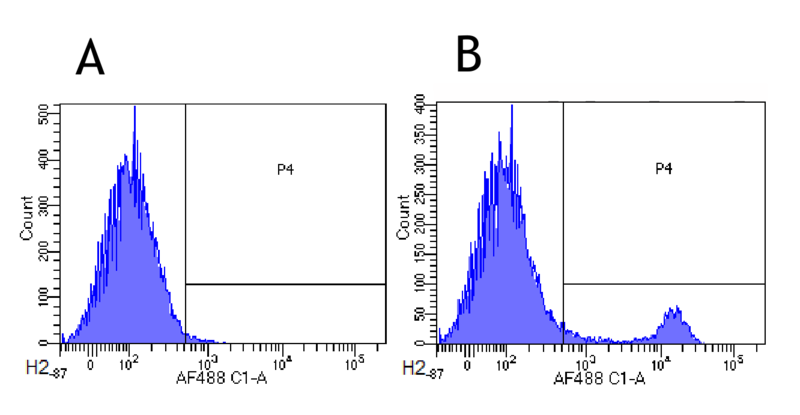 Flow-cytometry using anti-CD8alpha/Lyt-2 antibody YTS 169.4 (Ab00166) Mouse lymphocytes were stained with an anti-CD44 control (Ab00628-23.0, panel A) or the rabbit-chimeric version of YTS 169.4 (Ab00166-23.0, panel B) at a concentration of 1 µg/ml for 30 mins at RT. After washing, bound antibody was detected using a AF488 conjugated donkey anti-rabbit antibody (ab150073) and cells analysed on a FACSCanto flow-cytometer.